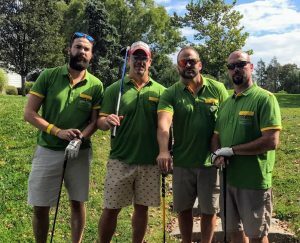 Advanced brought its best last Friday at the Preakness Valley Golf Course in Wayne for Backyard Beer Club’s™ 1st Annual Charity Golf Outing to raise awareness and funding for The Reed Foundation for Autism. The day was packed with raffle giveaways and prizes for accomplishments such as hole-in-one, longest drive, closest to pin, best dressed, and more. The team had a great time for a great cause. From left: Matthew Scheidel – AMC, Jason Franschman – member of the Reed Foundation, David Scheidel – AMC, Frank DeMaio – Director of Recreation in Nutley. The REED Foundation for Autism raises funds to support its community partners REED Academy, REED Next and REED Residence, a service of REED Residence. Community Partners provide individuals with autism access to high-quality education, employment and housing using the methods of Applied Behavior Analysis (ABA, the gold standard of care for autism backed by the CDC and US Surgeon General). Follow Advanced Mechanical to get updates on the team and our projects!